"Creamy low fat vegetarian soup." In a medium saucepan over high heat, combine the broth, potatoes, onions, carrots and celery. Bring to a boil and reduce heat to low. Cover and simmer about 15 minutes, or until potatoes are tender. Mash lightly with a potato masher. Add American cheese, milk and hot sauce and continue cooking over low heat until cheese melts, stirring occasionally. Add salt and pepper to taste. Garnish with fresh parsley and hot pepper sauce, if desired. Goat cheese is the star in this creamy soup made with Swanson® Chicken Broth. It was ok. I do not think I will make it again. 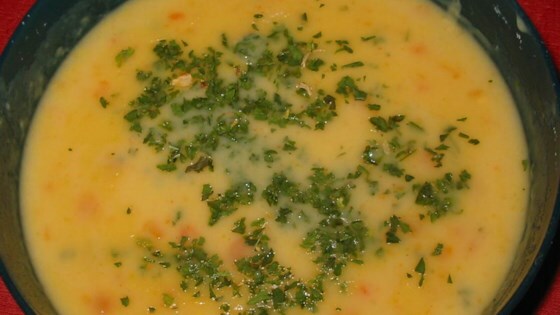 This soup is so good, it is impossible to tell it is low in fat. To make preparation even quicker, I use frozen pototoes and carrots. Tasted okay, but very, very watery. I would add another potato to thicken it. I also ended up adding some sour cream after it was done to make it a bit more creamy. Very fast to make though.